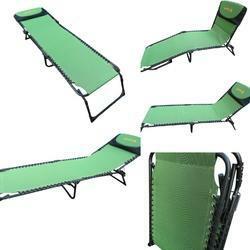 Leading Manufacturer of folding camping bed - padded - dark green, folding camping bed - padded - florescent green, folding beach bed - green, folding camping bed - extended ht.- grey, folding camping bed - blue and folding bed with mattress - 100 cm wide - beige from Surat. Size/Dimension 205 x 73 x 31 Cm Height. Easy folding and unfolding compact design bed with padding throughout length and width, adjustable back rest with 7 gears locking positions provides 7 different body postures in back rest with auto locking mechanism. 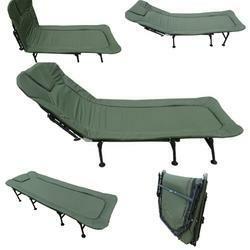 Scientifically designed to provide maximum comfort in sleeping and seating positions. Also provided with an inbuilt head pillow. Measurements - 205 x 73 x 31 Cm Height. Wt. - 11.0 Kg. SPECIAL INSTRUCTIONS - While folding opened bed, fold legs simultaneously pulling and holding of round black knobs provided on each legs unlocking it. Application of any undue excessive pressure without pulling the locking knobs may damage the frame and its locking holes. Dimensions : 189 x 58 x 30 Cm Seat Height. Weight - 8 Kg. Easily folding in 3 folds design make the product compact while folded. Light weight and compact design offers great portability. Back Rest is adjustable in 3 stages. Perfectly suitable for OPEN LOUNGE, GARDENS, FARM HOUSE, BEACH, TERRACE Etc. 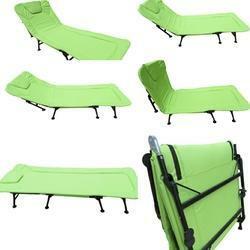 Folding beach bed is the product easy to handle and easy to carry for outdoor purpose,picnic at the sea beaches etc. 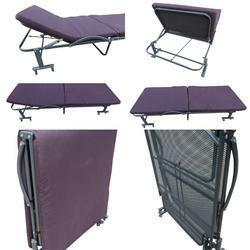 It is very light weight,compact and comfortable product for camping site.,materials used :frame : powder coated round tubular mild steel ,fabric : Oxford. 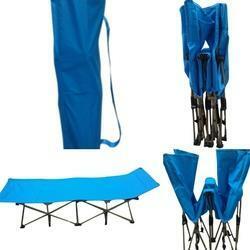 Easily foldable in seconds ,compact design ,reclining in 3 stages ,can hold weight up to 110 kg. 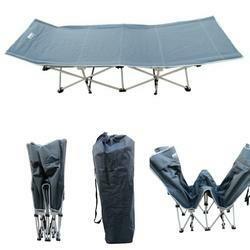 ,light weight ,easy to carry,weight :8 kg.,size :188 cm x 58 cm x 30 cm ht. Compact size and light weight design. PRODUCT IS DESIGNED FOR ONLY 1 PERSON TO SEAT AND SLEEP. Weight bearing capacity is 110 Kg. Dimensions : 188 x 66 x 37 Cms Height. , Weight : 6.4 Kgs. Features: Easy to carry Compact design Strong and durable frame Easy to fold and unfold in seconds Fully collapsible like Umbrella Strong and durable fabric Comfortable to sleep Convenient to use while traveling, camping, trekking Elevated head portion to give comfort of a pillow Supplied with a carry bag having a shoulder strap Easily washable fabric Materials Used : Powder coated round M.S. steel tubular structure frame 600D P.U. coated polyester fabric 600D P.U. coated polyester outer cover Moulded polypropylene connectors and riveted joints Colors Available : Olive Green Blue Dimensions : Open - 188 Cm x 66 Cm x 37 Cm Height Weight : 6.4 Kg. Size 195 x 65 x 32 Cm Height. Dimensions : 195 x 65 x 32 Cms Height. , Weight : 6.55 Kg. Features: Easy to carry Compact design Strong and durable frame Easy to fold and unfold in seconds Fully collapsible like Umbrella Strong and durable fabric Comfortable to sleep Convenient to use while traveling, camping, trekking Elevated head portion to give comfort of a pillow Supplied with a carry bag having a shoulder strap Easily washable fabric Materials Used : Powder coated round M.S. steel tubular structure frame 600D P.U. coated polyester fabric 600D P.U. coated polyester outer cover Moulded polypropylene connectors and riveted joints Colors Available : Olive Green Blue Dimensions : Open - 65 Cm x 195 Cm x 32 Cm Height Weight : 6.550 Kg. 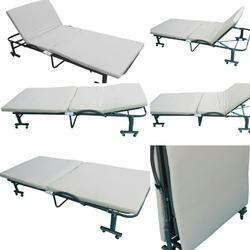 Folding Bed with Attached wheels makes this bed easily and conveniently portable with smooth movement. Dimensions : 190 x 100 x 35 Cm Ht., Mattress - 8 Cm. Thick. Wt. 30.5 Kg. Dimensions : 190 x 65 x 35 Cm Ht., Mattress - 8 Cm. Thick. Wt. 17 Kg. Dimensions : 190 x 80 x 35 Cm Ht., Mattress - 8 Cm. Thick. Wt. 20 Kg.